ZephIR’s industry-leading wind lidar system ZephIR 300 has been chosen by Babcock International Group to collect wind data on its pioneering floating lidar platform. The engineering support firm’s new platform allows the ZephIR 300 to collect data offshore without the need for post-processing or compensation, reducing the possibility of miscalculation or human error. The new technology will, once proven successful, significantly cut capital expenditure costs by removing the need for fixed meteorological masts. CAPEX costs for a fixed mast often reach in excess of £10m, while Babcock’s floating lidar platform will bring significant reduction in costs. The platform provides the stability needed to collect accurate lidar data by utilising a low-motion buoy. 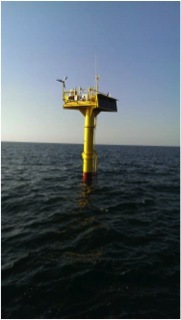 Babcock’s marine expertise means the buoy has been shown to pitch and roll less than five degrees from vertical in waves of up to 4.25m Significant Wave Height (Hs). All wind lidar systems are susceptible to the water’s motion impacting on the quality of the collected data, thus requiring physical motion compensation systems or post-processing of data using complex algorithms to offset this. This can introduce additional risk and uncertainty. Of the two types of wind lidar, continuous-wave lidar- such as the ZephIR 300- has been shown to have very little susceptibility. Therefore, continuous-wave lidar lends itself to low cost installations with no mechanical or electronic post-processing if a suitable platform, such as Babcock’s new low-motion spar buoy, can be provided. ZephIR300 visible in left corner. spar bouy. To download a PDF copy of this release, click here. In 2003 we released the first commercial wind lidar, ZephIR®, exploiting decades of research at UK government Research & Development establishment QinetiQ. Designed specifically for the wind industry ZephIR has paved the way for many of the remote sensing devices seen in the market today. Our original lidar technology continues to innovate with world firsts such as taking measurements from a wind turbine spinner and being the first to deploy an offshore wind lidar, both fixed and floating. ZephIR has also now amassed more than 3.5 million hours of operation across 650+ deployments globally spanning a decade of commercial experience. For wind measurements onshore, offshore and in turbine-mounted applications, ZephIR provides accurate, reliable finance-grade wind data. Zephir Ltd. is a wholly owned subsidiary of Fred. Olsen Ltd. – established in the UK in 1963 with business interests primarily focussed on renewable energy, including ZephIR. Babcock is the UK’s largest engineering support service company and a FTSE 100 company. Our heritage brings unparalleled experience in the design, analysis, development, testing, manufacture and in-service support of high integrity marine assets. We focus on markets and customers with complex long term infrastructure and assets management requirements. Our core skills are in asset management, project management and engineering excellence. We have a track record of designing and building sophisticated one-offs that must operate on first deployment. Our experience and expertise in the design, manufacture, and project management of large scale projects for the marine environment is ideally suited to the development of devices in the emerging marine renewable market sector. 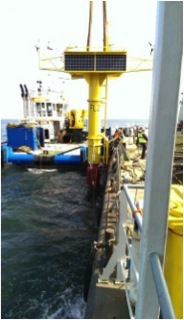 We have executed a range of projects in the marine renewable sector including our latest Floating Lidar system. Visit www.babcockinternational.com for more information.